Just updated our SMF Page with a couple of our latest designs. Now that's a cool theme JB. Why don't you add that here as well, it will be a nice touch from the current with the people smiling at top. I think we have enough Skins here, plus we have Threads on that in the Feedback Board. This Thread is about SMF Themes for those that use Simple Machines Forum script. That is a really nice theme JB, how long does it take you to create something like that and can you do it for other forum software besides Simple Machines? That one took a couple of days. Easier themes can be given to the client within 24 hours. Yes, we can do themes for other software that are template based. Contact us if you need one done for you. 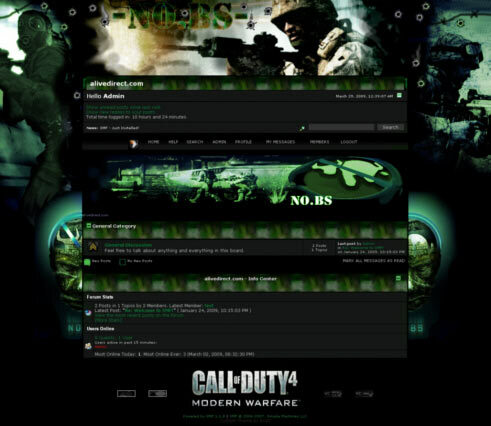 That CoD theme looks awesome. Just a question, do you recommend going with SMF 2 or stick with version 1 still? I would like to keep this Thread about SMF Themes we custom build so I will answer your question in the new SMF Tips Thread I saw you start.